I've always loved shoes. My mom loves to tell me my first phrase as a kid was, "New shoes." Creating an outfit around new shoes is so much fun. And I used to think that the more shoes the better. But in recent years I've started to change my tune. I've been working on building a better quality shoe collection. One that is comfortable and long lasting. Now I really try to only buy leather or suede, look for variety in sizes (I sometimes border on wide), and make sure there is enough cushion and support. I've been fortunate to try out some shoes that I've really found amazing like 4EurSole sandals and booties, JaVie flats, and now Foot Petals flats. So far I've really liked wearing these more comfortable brands and found them to be great compliments to my outfits! They are worth the additional cost because they last so much longer, too. 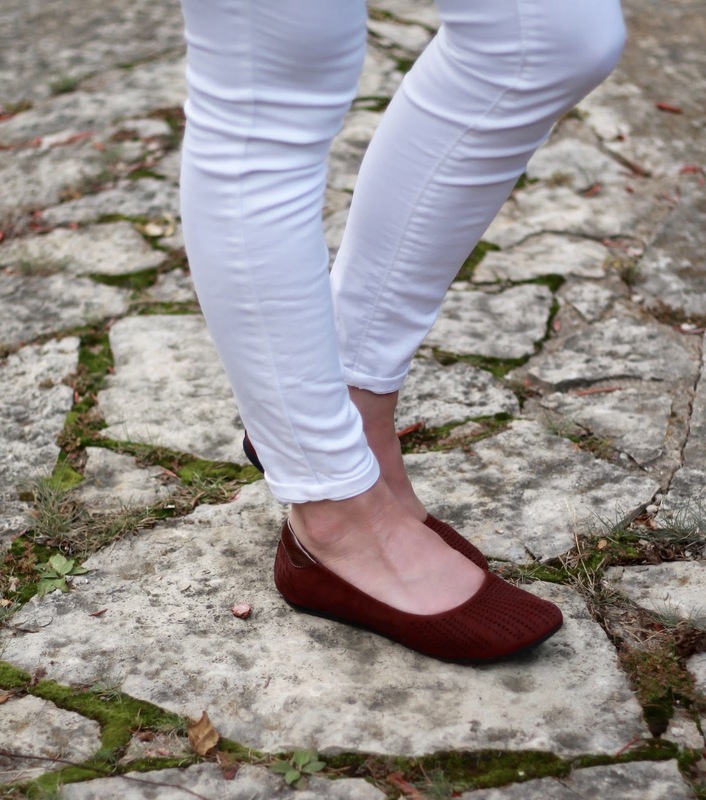 These burgundy flats by Foot Petals are the newest to my closet. I got them through Influenster to try out and I love them so far! I have wanted a pair of burgundy shoes and these are really comfortable. The cushion in them is amazing and really absorbs shock while you are walking throughout the day. I would caution that they run small though. I am typically a 7.5-8 and the 8 is a bit snug, especially at the end of the day when my feet are a bit more swollen. Do you go for quality or quantity with your shoes? Oh yes, good shoes are worth the cost. I used to grab shoes whenever I went shopping. Now I look for comfort and quality! You look adorable Laura! These shoes look so comfy and chic! Love this classic look! Burgundy shoes are a fun touch with this classic outfit! Good choice! Laura, you continue to look so cute throughout your pregnancy. I love the burgundy with the white and chambray. A perfect fall combo. I've finally reached the age where I will splurge (for me) on shoes. I haven't reached the age where I'll pay over $200 though. I'm not sure I'll ever be that old...hahaha! Yesss, comfy shoes are a must- especially for pregnant babes! These are so chic + versatile. Such a cute story about you when you were little! And how great that the flats are cute AND comfortable! It's great when you can find shoes that are cute and comfy. I am sure comfy shoes are important right now for you!! I love when they are comfy and stylish, like the pair you have on! 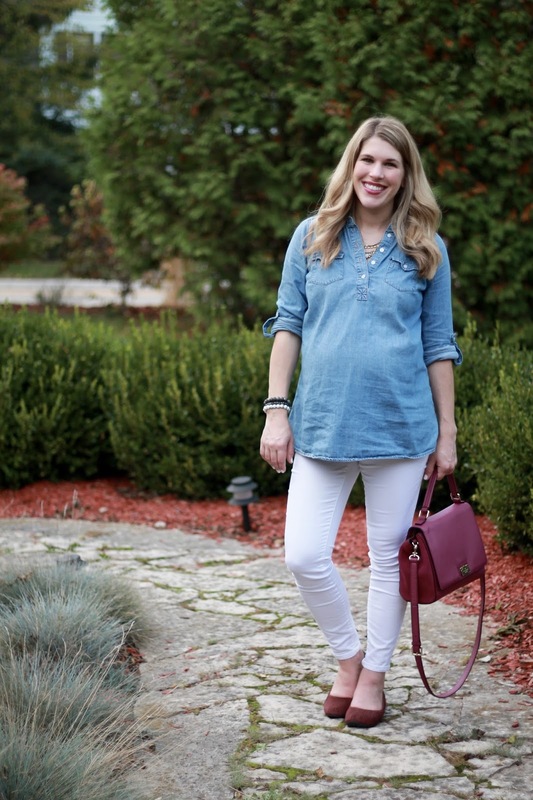 I love white denim with chambray! I think it's fabulous that we can finally get both comfort and style in our shoes nowadays!! Because even though I think a great looking shoe can make all the difference in our outfits, I also think it's nice for it to feel good too!! These flats sound fabulous. It's nice to have a flat that isn't too flat!! Comfy shoes are a must! I always want them to be cute, too! Love the white jeans after Labor Day for Fall! You look adorable and a great comfy (and cute) shoe is a must! These shoes look so cute and comfy. And the color is great for fall, too. I'm all about cute and comfy shoes. Loving this white and chambray combo! Those are really cute shoes daer. Love the simplicity of the style, and the details. You paired it perfectly with white pants. Hope you're having a lovely weekend! We got outside to enjoy the sun a little today which was nice, after a tough day yesterday with an unwell toddler! Thanks for linking up to Top of the World Style. Nice look! The combination of white withe blue denim is always a winner. Such a cute look - maternity or not! And I love those flats - they look so comfy and that color is great for fall! Finding shoes that are both cute and comfortable is always one of the biggest challenges in life! I'll have to check these out. And that is so cute that your love of shoes goes all the way back to childhood. They are comfortable from the first wear.